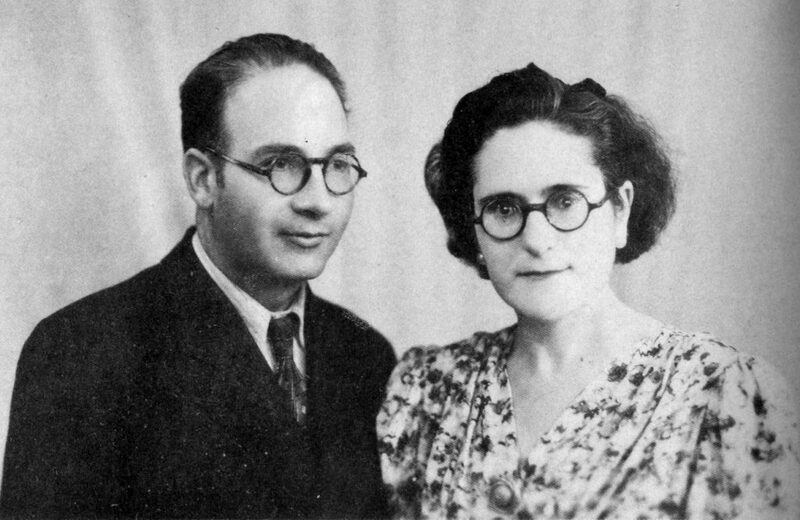 May 1937: “In May 1937 Spanish republican carabineros at the Puigcerdá border post stopped and searched a CNT staff car carrying two members of the CNT National Committee: Máximo Peris García and Aurelio Pernia Álvarez. 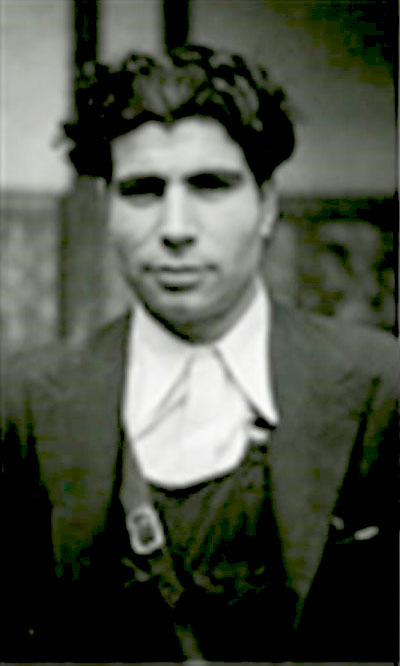 The driver was Gregorio Elías Soriano. In the car they found suitcases containing gold bars and precious stones to the value of 700,000 pesetas. Threatened with summary execution unless they admitted to whom the haul belonged the pair gave a written statement that the gold and gems were given to them by CNT secretary-general Marianet to sell in France. The proceeds of the sale, they claimed, were to be used to purchase goods and equipment for the organisation. “When the National Committee learned of the arrests, and the damning confession made by its two members, Marianet instructed CNT lawyer Benito Pavón to extricate them from the embarrassing predicament in which they now found themselves. His advice was to find someone of good moral standing within the organisation, to act as scapegoat and take responsibility for the contraband. That someone, at Marianet’s and Esgleas’s suggestion, was Joaquín Ascaso, the president of the troublesome and embarrassing — to the CNT’s National and Catalan Regional Committee that is — independent Council of Aragón. The choice of Ascaso as criminal fall-guy served a double purpose of course, with the likelihood of the CNT’s exclusion from the incoming Negrín government, in spite of Marianet, Montseny and Esgleas’s hard lobbying for ministerial positions in the new administration. A now desperate National Committee was ready to seize upon any excuse to demonstrate its respectability, especially if it was at the expense and to the detriment of the reputation of the Council of Aragón, whose radical programme of socialisation had caused it and the regional committees serious political discomfort. 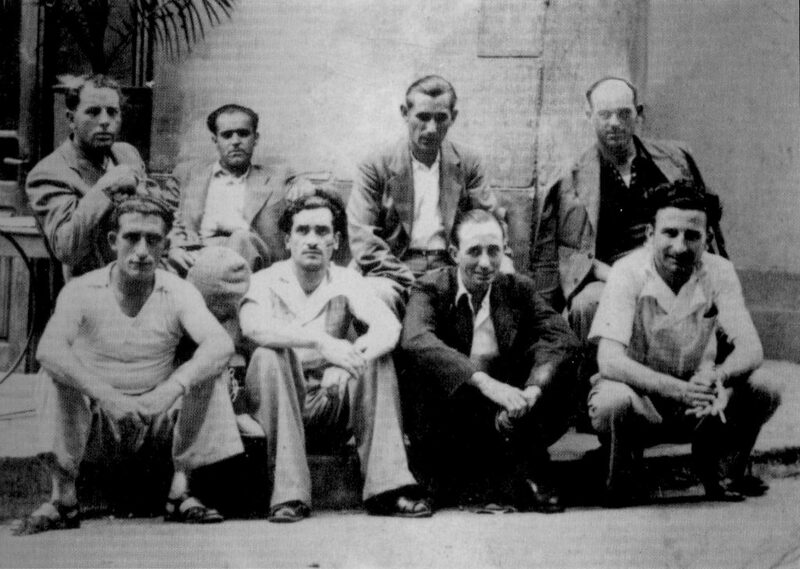 “When Esgleas initially proposed the idea to Joaquín Ascaso, in May 1937, he played on the awkward situation the affair would create for the CNT when it came to court, promising Ascaso that if he agreed to be the scapegoat the case would be dealt with quickly, and he would be in no danger. García Oliver, the then outgoing Justice Minister in Largo Caballero’s government, would ensure that the files disappeared. So, as a good militant, and against my advice as well as that of Antonio Ortíz, head of the Confederal 25th Division in Caspe, Ascaso naively and selflessly agreed to carry the can for Marianet and Esgleas in order to spare the CNT’s good reputation. May 17, 1937: “Marianet was an “unconditional” supporter of the Negrín government which came to power on 17 May 1937 on the back of that month’s Stalinist provocations at the Barcelona Telephone Exchange. It is also undisputed that Marianet and his placemen, including Montseny and Esgleas here, were constantly manoeuvring for the CNT-FAI’s full participation in the Negrín government — and seeking peace negotiations with Franco. In August 1937 it was Marianet who delivered the coup de graçe to the revolution with a letter to his hero, Prime Minister Dr Juan Negrin, disowning the Council of Aragón, the last remaining organ of popular revolutionary power in Spain, thereby sacrificing the CNT’s achievements and influence in the region and offering it up to be crushed by the Stalinists and bourgeois Republicans. 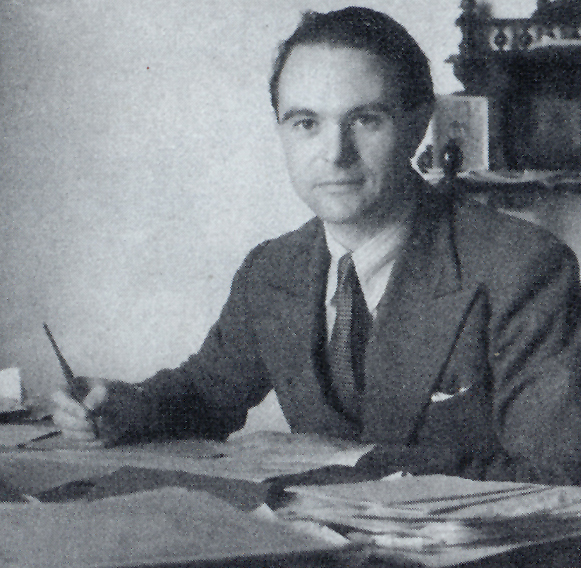 Antonio Ortiz Ramírez (1907 – 1996). August 1937: “Ortíz warned Ascaso he was being set up: ‘Can’t you see what you are doing?’ he said. ‘You are handing over Aragón, the Council, the collectives and everything we’ve achieved over these past twelve months just to keep these miserable, cowardly arseholes out of jail. Marianet and Esgleas should have the good grace to admit what they have done and resign from the National Committee.’ Our protests went unheeded. The file, a big fat one, didn’t go astray; it went straight into the hands of the incoming Minister of Justice, Manuel de Irujo, a deliberate act by Esgleas and Marianet to incriminate Ascaso who, in spite of everything, continued to insist on shouldering responsibility for the smuggling operation. Ascaso was finally arrested on 12 August as he was preparing to return to Caspe after a CNT plenum of regional committees in Valencia. His arrest coincided with President Azaña’s public announcement of the dissolution of the Council of Aragón. Both the examining magistrate and state prosecutor in the case, Eduardo Ortega y Gasset, knew that Ascaso was innocent of the crime to which he had confessed and urged him to defend his good name and integrity by refusing to take the blame. 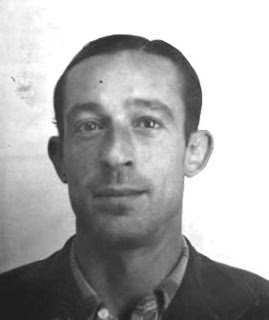 But Ascaso, loyal comrade that he was, stuck to his confession, claiming the gold and jewels came from the revolutionary committees of Aragón and he, personally, had given them to the two National Committee representative to sell in France to buy much needed agricultural equipment for the Aragón collectives. July 1938: “But that wasn’t the end of the matter. These ‘notables’, specifically Marianet and Esgleas, spread poisonous rumours that comrades Ascaso and Ortíz had, between them, accumulated a personal fortune in France worth millions — the mythical ‘Treasure of Aragon’. The gold and jewels discovered by the carabineros in Puigcerdá were a drop in the ocean according to the stories they fed to the rumour mills at the time. Little wonder then, with threats growing against them from Negrín’s Communist-led military high command and a coordinated whispering campaign conducted by their alleged comrades on their own National Committee, that Major Antonio Ortíz, Joaquín Ascaso, former president of the Council of Aragón, and nine other members of the 25th Army Division (the militarised Ortíz militia column) escaped into France in the early hours of 5 July 1938, where they surrendered themselves to the Gendarmes in Vic. According to the French police report, the men were starving and none was in possession of weapons, money or valuables. When Farquhar met them in Perpignan the following year none of them had a peseta to their name. “The story circulated by Esgleas and Marianet was that the comrades had ‘deserted’ their posts and absconded to France with stolen CNT-FAI funds — and they had Ascaso’s ‘confession’ to prove it. Miguel García Vivancos, a vaultingly ambitious ‘comrade’ from the 1920s who had replaced Ortíz as commander of the 25th Division, was among the quickest to denounce them as traitors, ordering his men to shoot them on sight. There was to be no arrest, no hearing, and no trial. “In France, the first port of call of this treasure-laden caravan of six trucks and a car was the Chateau d’Aubiry. In the car were Marianet (Vázquez), Montseny, Esgleas and the ubiquitous, cosmopolitan, German-born truss salesman André Germaine*, a shadowy figure who claimed to have been present at most of the potentially revolutionary tipping points of post-1918 Europe, from the Spartakist uprising in 1920 through the factory occupations in Italy to the Asturias uprising of 1934. Until the final days of the Civil War, Germaine had been a paid official of the CNT-FAI with ‘special responsibility’ for Spain’s border with France. “*André Germaine, a freemason and a close friend of Pierre Bardou the owner of the Chateau d’Aubiry, was a high-ranking office-holder in the liberal and secular Grand Orient de France who emigrated to Chile in late 1939 where he established a major trucking firm. He died in Santiago de Chile in 1964. “The driver, ‘J.M.C.’ — an informer on Cerrada’s payroll, which was how he knew of the clandestine operation — worked for José Minué, head of the CNT-FAI’s foreign intelligence service (Minué was the brother-in-law of Manuel Escorza del Val, republican Spain’s latter-day Robespierre, the morally and physically crippled head of the CNT-FAI’s Servicio de Información y Coordinación [SIC] — another piece of work). 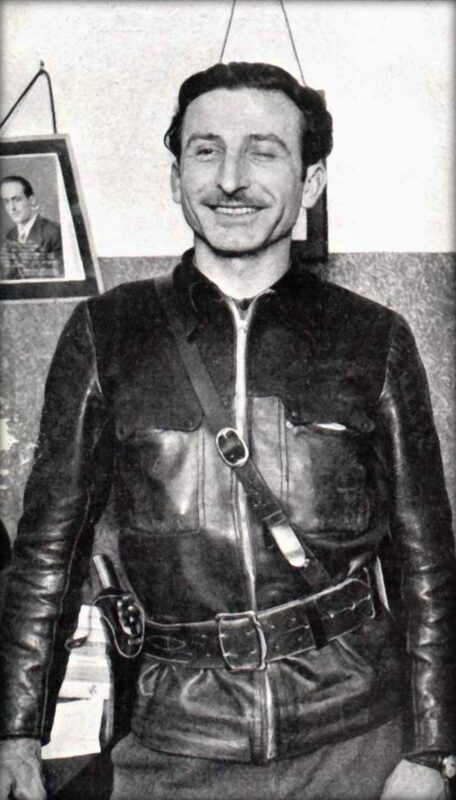 Minué was also on the MLE Executive Council, and had played a prominent role in enforcing militarisation, governmental collaboration, and the repression and murder of rank-and-file militants, the ‘uncontrollables’. Farquhar despised him, considering him to be one of the guilty men and women responsible for the collapse of popular morale and Franco’s ultimate victory. “The caravan story had been confirmed to [Juan] Busquets, by an elderly estate worker at the Chateau. What happened to the CNT’s assets remains a mystery to this day. Esgleas initially denied their existence, and consistently refused to account for them. Nor did he ever explain what happened to the 2.5 million French francs he had received from the Spanish Aid Committee when it was formally wound up in the summer of 1939. At the end of the Spanish Civil War, this committee, headed by former prime minister and president of the Cortes, Diego Martínez Barrio, shared out the remaining governmental funds, on a pro-rata basis, to each of Spain’s political parties and organisations, of which 2.5 million francs were divided equally between the CNT and the FAI. Juan García Oliver and Horacio Prieto were nominated, respectively, to receive these monies on behalf of the two organisations. García Oliver later told Farquhar that when he and Prieto visited Martínez Barrio, in the presence of Federica Montseny, they were each handed one-and-a-quarter million francs in 1,000-franc notes. ‘The money didn’t even have time to warm our hands,’ he recalled. ‘As we left the Aid office Germinal Esgleas was hovering outside the door waiting for us, like a vulture, to claim the money on behalf of the MLE Executive Council.’ Needless to say, Esgleas’s opposition to government collaboration didn’t preclude him from accepting a divvy-up of government funds. 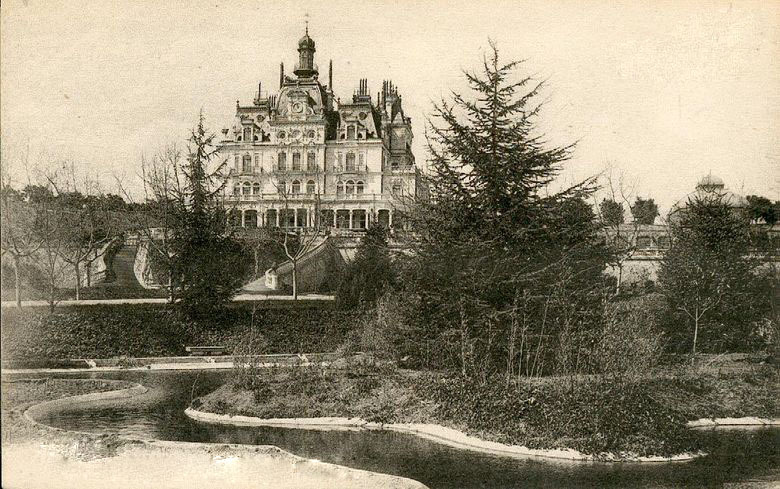 “Shortly after arriving in France, Esgleas — with the financial and legal assistance of André Germaine — purchased a property in the Dordogne, near La Charrière, three kilometres from Salon, where he set up home with Federica — who by this time had assumed the name of ‘Fanny Germaine’, perhaps to avoid being extradited back to Francoist Spain, although that would seem to have been unlikely in pre-Occupation France. André Germaine bought an adjoining farm at the same time. Where his money came from was a mystery; suffice it to say that Germaine was a signatory to the CNT-FAI National Committee’s bank accounts and was responsible, in late 1938, for setting up and transferring the union’s funds to the Swiss bank account of the newly-formed Executive Committee of the MLE. 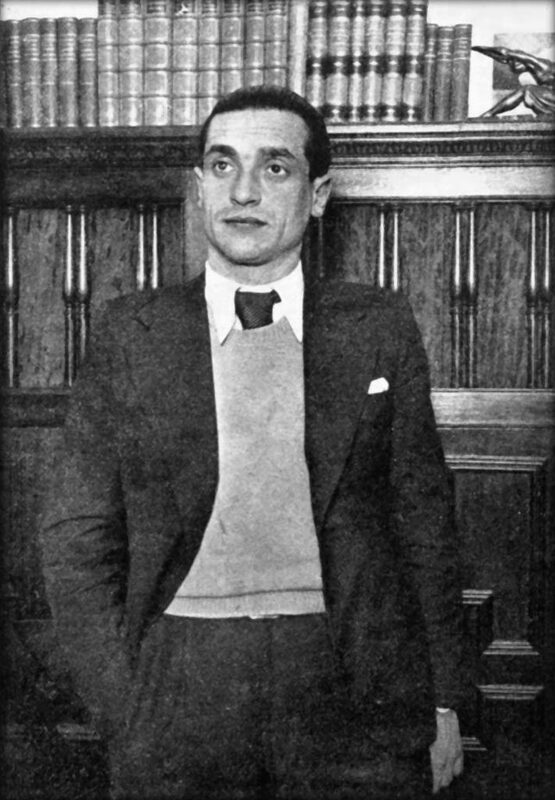 March 1939: ‘On 17 March 1939, a week after crossing into exile in France, Secretary-General Marianet travelled to London with Bartolomé Pascual, José Pros and Facundo Roca Gascó — the latter being the Paris-based CNT-FAI intelligence officer who procured the poison intended to murder Ascaso and Ortíz — for a secret meeting with Bank of England officials in an attempt to negotiate the recovery of funds previously transferred to the UK by the Negrín government. [See also here]. This London meeting had been arranged through the offices of the Madrid-based British naval attaché, Captain Alan Hillgarth, a British Intelligence officer with staunch integrist Roman Catholic and ardent pro-Francoist sympathies. “’Another reason for the National Committee’s trip to London was to liaise with Colonel Segismundo Casado, head of the former republican National Defence Council, to coordinate the shipping to London of whatever economic assets and produce that could be smuggled out of Spain. 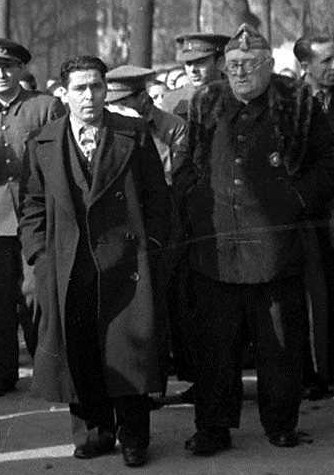 Manuel González Marín (1898-1950) with General Miaja, Madrid, March 1939. “‘On his return to Paris, Marianet instructed González Marín, the CNT’s Treasury and Agriculture secretary in the Casado administration — which now constituted the republican government in Madrid — to order the director general of security in Madrid to collect the maximum possible amount of foreign currency, ostensibly to fund the activities of the various Evacuation Juntas, a sum that amounted to nearly 80 million francs. Marín also ordered four ships of large tonnage to put in at Valencia to load cargoes of almonds, mercury, and saffron, etc., to sell on the international market, the revenue from which was supposedly intended for the Evacuation Juntas. Again, no monies ever reached these committees. June 1939: “‘By the 18th of June that year Marianet” was dead, drowned while swimming in a lake by the river Marne south of Paris. In spite of the fact that he was known to be a strong swimmer, the coroner recorded a verdict of “accidental death by drowning”. “‘Present that fateful day at the picnic with Marianet was José María Villanueva, a member of the CNT-FAI foreign intelligence service, who is here with us in this room today . . .’ Farquhar nodded in the direction of a well-dressed elderly man seated at the rear of the room. The man returned his stare, dispassionately. Farquhar continued: ‘. . . as indeed were comrades Esgleas and Montseny, all of whom watched from the shore as the “gypsy-king of the construction union, the sobriquet by which Marianet was known, struggled helplessly in the water. No one went to his assistance.